BRETIGNY-SUR-ORGE, France (AP) — A train carrying hundreds of passengers derailed and crashed into a station outside Paris on Friday on the eve of a major holiday weekend. At least seven people were believed killed and dozens were injured, the interior minister said. The crash at Bretigny-sur-Orge station is the deadliest in France in years, and French President Francois Hollande abandoned plans in the capital to visit the scene. Some cars slid toward the station, crushing part of the metallic roof over the platform. Images from the scene shown on French television showed gnarled metal and shards on the platform, and debris from the crash clogging the stairwell leading beneath the platform. "I heard a loud noise. A cloud of sand covered everything," one witness, Bazgua El Mehdi, 19, who was on a nearby train, told Le Parisien newspaper. "Then the dust dissipated. I thought it was a freight train, but then we saw the first casualties ... Many passengers on the (train) were crying." Officials didn't comment on reports that some of the passengers may still be trapped on the train. It was unclear whether all the casualties were inside the train, or whether some had been on the platform, or how fast the train was traveling. The head of the SNCF rail authority, Guillaume Pepy, called it a "catastrophe." "Some cars simply derailed, others are leaning, others fell over," he said. Interior Minister Manuel Valls said at least seven people are believed dead and several dozen injured, but added that the casualty toll is "in constant evolution" and could rise. 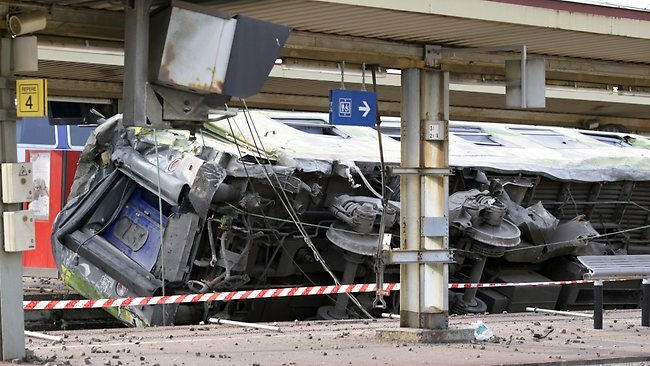 The SNCF said the train was carrying about 385 passengers when it derailed Friday evening at 5:15 p.m. (1515 GMT; 11:15 a.m. EDT) and crashed into the station at Bretigny-sur-Orge, about 20 kilometers (12 miles) south of Paris. The train was headed from Paris to Limoges, a 400- (250-mile) kilometer journey and was about 20 minutes into what would have been a three-hour journey. The accident came as France is preparing to celebrate its most important national holiday, Bastille Day, on Sunday, and as masses of vacationers are heading out of Paris and other big cities to see family or on summer vacation. All trains from Paris' Gare d'Austerlitz were suspended after the accident. A passenger speaking on France's BFM television said the train was going at a normal speed and wasn't meant to stop at Bretigny-sur-Orge. He described children unattended in the chaotic aftermath. He said there are swarms of emergency workers at the scene. AT LEAST seven people have been killed and dozens injured after a speeding train split in two and derailed at a station in the southern suburbs of Paris. Interior Minister Manuel Valls gave an initial toll of seven dead and said there were "dozens of injured'' following the accident at the Bretigny-sur-Orge station involving a train heading from Paris to the west-central city of Limoges. Many passengers were believed to be trapped inside wrecked carriages that were lying on their sides after the accident. "The toll at this stage is constantly evolving and will be heavier,'' Mr Valls told reporters in Nimes. Officials didn't comment on reports that some passengers may still be trapped on the train. It was unclear whether all the casualties were inside the train, or whether some had been on the platform, or how fast the train was traveling. The head of the SNCF rail authority, Guillaume Pepy, called it a "catastrophe." The local prefect's office said at least six people had died and 12 injured, including nine in a serious condition. Mr Pepy told reporters at the scene that six carriages had derailed during the accident. The train's third and fourth carriages derailed first and the others followed, he said. A clearly emotional Mr Pepy expressed the rail company's "solidarity with the victims and their families''. "Rail catastrophes are something that upset everyone and all of those who are committed to our national rail service,'' he said. Passenger Marc Cheutin, 57, said he had to "step over a decapitated person" to exit the carriage he had been travelling in. "Shortly after departure, just as I was getting into my book, we felt a first shock that shook the carriage I was in.... Then there was a second shock and the carriage lifted up, then a third and a fourth and the carriage went over on its side," he said. The prefect's office said a "red alert'' plan had been activated following the accident, which officials said happened at 5.14 pm (1.14am AEST), minutes after the intercity train left the Paris-Austerlitz station. The cause of the accident was not immediately known, but sources said part of the train split and rolled on its side as it arrived at the station. "The train arrived at the station at high speed. It split in two for an unknown reason. Part of the train continued to roll while the other was left on its side on the platform,'' a police source said. 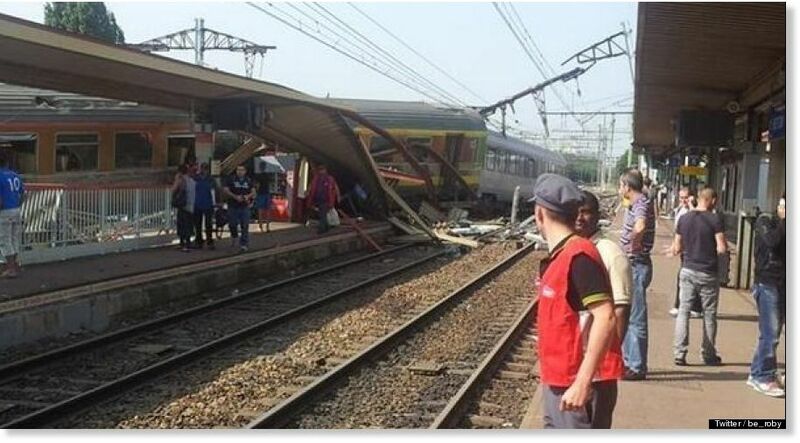 "It was not a collision and it was not a problem with the speed,'' a source with the SNCF said. Bretigny Mayor Bernard Decaux told newspaper Le Parisien there was chaos at the station. Dozens of emergency and police vehicles had arrived at the scene and a security cordon was set up around the station. Rescue helicopters had been deployed and all Paris region hospital had been put on alert to deal with the wounded, officials said. Photographs of the accident posted on social networks showed a train carriage that had apparently derailed and risen onto the platform, tearing down a section of the station's roof as it moved forward. The accident came as France is preparing to celebrate its most important national holiday, Bastille Day, on Sunday, and as masses of vacationers are heading out of Paris and other big cities to see family or on summer vacation.. Travel to and from the Austerlitz station in Paris had been temporarily suspended. Yes very sad. Don't understand why this happen. I normally feel safer on the train than on the airplane. How truly frightening, just awful. Im the same would rather catch a train than a plane but I guess nothing is accident free. There seems to have been some really awful transportation related accidents recently. A plane crash in San Francisco, a runaway train in Canada (with the death toll continuing to rise) and now this train near Paris. My heart goes out to the families of those lost.